Come and get it, hot off the presses... the last Brews & News of 2015! I just wanted to send a note out to thank you again for ALL the wonderful gifts you brought to the meeting today for our 6th Annual Toy Drive. I was overwhelmed by your generosity in bringing so much for the kids. I believe that this was the biggest collection of gifts that we have ever gotten. I am humbled and so proud of our club. What wonderful hearts you all have. Ballast Point- Calm Before The Storm Cream Ale with coffee and vanilla, 5.5% from San Diego, CA. The Maltose Falcons will be conducting a series of mead classes in January. The primary purposes are to teach people how to evaluate mead. We will be teaching according the the BJCP style guidelines in preparation for a BJCP Mead Exam that will be held on Feb. 6. 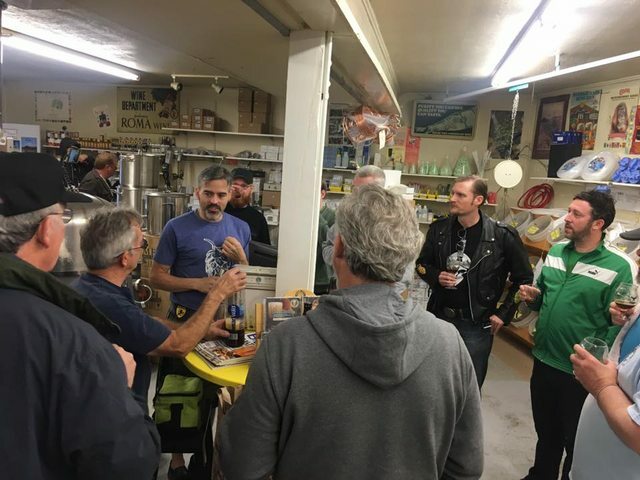 There will be four classes on Tuesdays at 7 PM at the Home Beer and Wine Shop. They will be on Jan. 5, Jan 12, Jan 19, and Jan 26. We'll be serving dozens of different meads and going into detail on honey varietals, melomels, metheglins, and other meads. We will be featuring New Belgium and Ben & Jerry's New Collaboration Beer!! with puchase of this rare limited beer!! Read more about Recaps Galore! Yesterday, Denny Conn and I debuted our brand spanking new podcast - Experimental Brewing with Denny and Drew! Go give it a listen today! Read more about Brand Spanking New Podcast! Falcons, sign up now for the October Club Shop Brew Session Sunday, Oct. 25, as our new Board Member and Newsletter Editor Andy Ziskin leads the crew in making an American Pale Ale. Andy is an award-winning homebrewer, and a damn good guy, so you'll benefit from his experience and skills, and have a great day! We will be meeting at 7PM at MacLeod's Ales in Van Nuys. Help the club plan our competitions and maintain our high standards of running great contests. The club will buy our beer and dinner. RSVP with Ed or John at vicepresident@maltosefalcons.com if you can make it. Brews and News is Back! on Oct. 10th! Look for a full report in 2 weeks in the November issue. Read more about Brews and News is Back! Remember the time change is Sunday Nov 1, 2015 2AM PDT becomes 1AM PST. That means you won't lose any sleep when you come to the 11:00 am Meeting!!! A slightly modified get started guide from Drew's Everything Hard Cider Book to make your own hard cider. This is the basic process that you’ll use for every cider in Everything Hard Cider and almost every other fermentation you can think to perform. This recipe will net you 4 large bottles of inexpensive cider. You can enjoy this cider after 4–8 weeks. Featuring over 8 Limited Beers on Draught from Stone Brewing Co. There will also be Stone Beer Inspired Appetizers!!! !